The letter took nearly two years to write. After all, how can someone sum up in words their gratitude to the person that saved their life and the life of their unborn child? That’s the kind of letter that Hall County Fire Chief Jeff Hood found sitting on his desk earlier this month. On July 7, 2013, Hall County resident Julie Carnes began hemorrhaging in her sleep. She was 34 weeks pregnant and had been diagnosed with placenta previa. The condition occurs when a baby’s placenta partially or completely covers the opening in the mother’s cervix and results in a high-risk pregnancy. Since it was a holiday weekend, Julie’s main obstetricians were both out of town, and the on-call physician advised her to go to a hospital an hour’s drive away. That’s when Julie decided to call 911. “When Station 14 got the call that fateful night, they were already at my house by the time I got out to the porch,” said Carnes in her letter to Chief Hood. She said that’s when a hero, Hall County Emergency Medical Technician Jonathan Baker, emerged. Luckily, Carnes delivered a healthy baby boy named Sam a short time later at the Gainesville hospital. After receiving the letter, Chief Hood helped organize a reunion between Carnes, her son Sam and their hero. 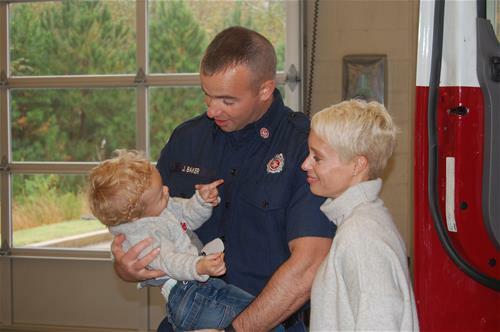 The two met with Jonathan Baker at 11 a.m. on Tuesday, Oct. 27 at Station 14.